"Some people are going to love you no matter what you do. And some people will never love you no matter what you do"
Fake Love expresses so much in such a small pendant. The titled heart represents all of your strengths, the power within you, so strong causing a stronger effect on the heart. 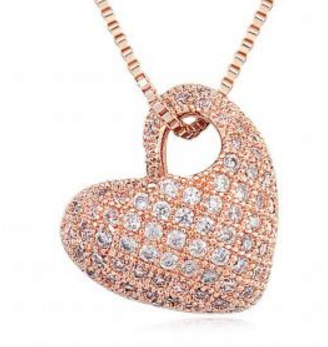 In rose gold embedded with small crystals and hung on a beautiful thin rose gold chain, you cannot go wrong with this absolute must have item.